The Industry 4.0 is defined as a collective term for technologies and concepts of value chain organization which combines cyber-physical systems, the Internet of Things and Internet-based digitization technologies. It can support productivity increases by connecting industrial value adding processes across several supply chain tiers. In ongoing discussions about Industry 4.0 supply chain management, it is often seen as one of the largest profiteers in industrial companies while its impact on purchasing has merely been considered by academic and practical research. 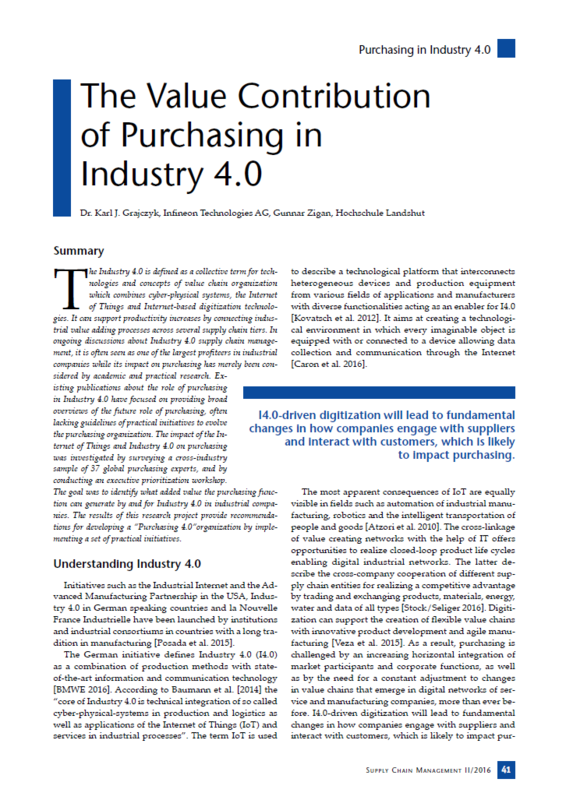 Existing publications about the role of purchasing in Industry 4.0 have focused on providing broad overviews of the future role of purchasing, often lacking guidelines of practical initiatives to evolve the purchasing organization. The impact of the Internet of Things and Industry 4.0 on purchasing was investigated by surveying a cross-industry sample of 37 global purchasing experts, and by conducting an executive prioritization workshop. The goal was to identify what added value the purchasing function can generate by and for Industry 4.0 in industrial companies. The results of this research project provide recommendations for developing a “Purchasing 4.0”organization by implementing a set of practical initiatives.